Stormwater is seen as a water resource that needs to be captured, stored and utilised in meeting current and future water supply demands. However, increase in impervious surfaces due to expansion of urbanisation has led to increase in pollutants being transported through stormwater runoff and an increased risk of flooding. The world’s urban population continues to steadily grow, and the absolute increases in urban populations remain very high and are expected to reach 66% of total world population by 2050. Consequently, ongoing development on managing water resources and water sustainability in urban environments is needed to address risks from increased stormwater flows arising from further development of impervious areas, due to expanded human populations and urban growth. 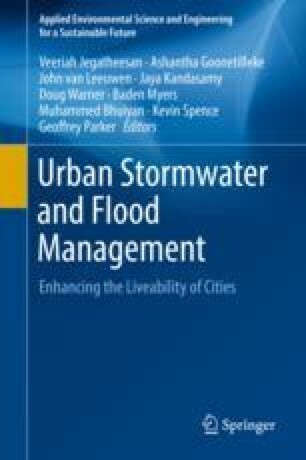 This introductory chapter gives an overview of past and current management of stormwater for flood mitigation, for improved stormwater quality and sustainable practices such as SuDS, LID and WSUD. Existing governance for stormwater management and flood mitigation in selected cities is also included to identify future needs for improving liveability.